Stagnation. While Nvidia at least manages a small performance leap with its GeForce GTX 880M, AMD is going around in circles with its Radeon R9 M290X. However, this does not stop many laptop companies from selling the "new" GPU. The Guru Earth V sports two AMD chips that operate in Crossfire mode. Is the existence of this GPU array justified? The Guru Earth V can be configured up into the last detail on the manufacturer's homepage. In our opinion, one of the most important decisions is selecting the underlying barebones. 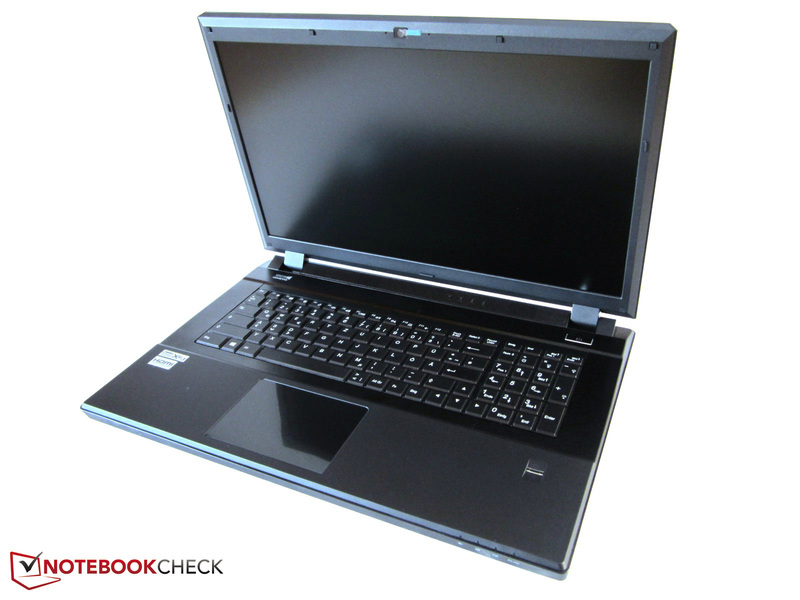 In addition to the relatively plain P370SM, which we tested in the form of the One K73-3S and Schenker XMG P723, Notebookguru also offers the considerably more eye-catching P375SM (see Eurocom X7 for comparison). The casings are identical under the hood. 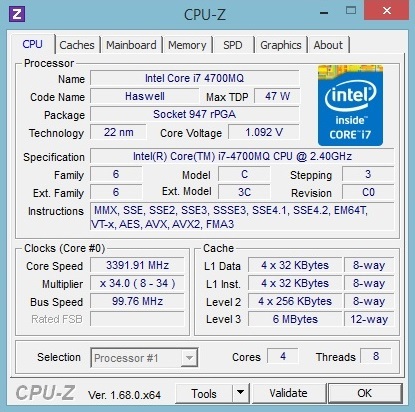 One of Intel's latest dual or quad-core processor from the Haswell generation is installed. The range reaches over the attractively priced Core i5-4200M (max. 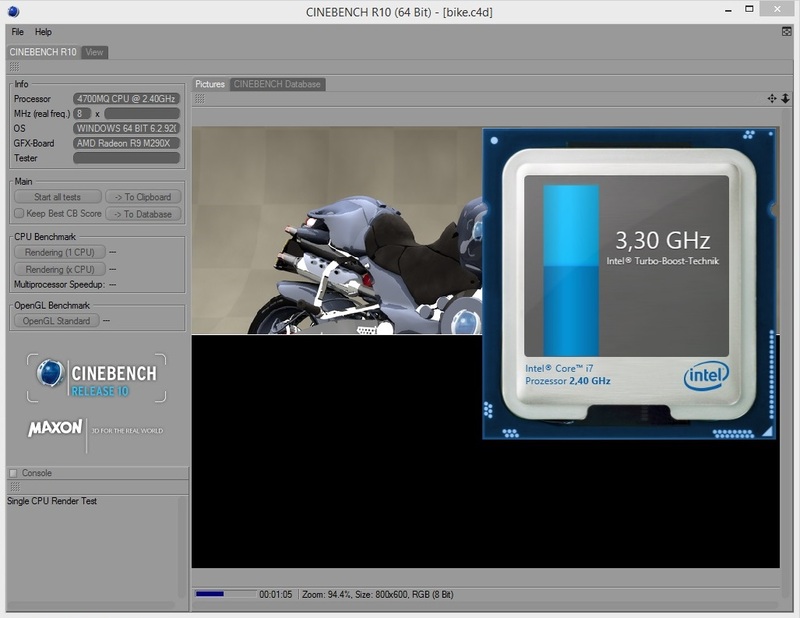 3.1 GHz) up to the wickedly overpriced Core i7-4930MX (max. 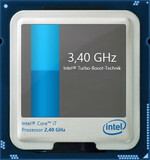 3.9 GHz). 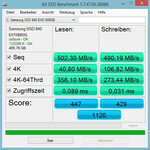 In view of speed, the author would at most opt for the Core i7-4800MQ. 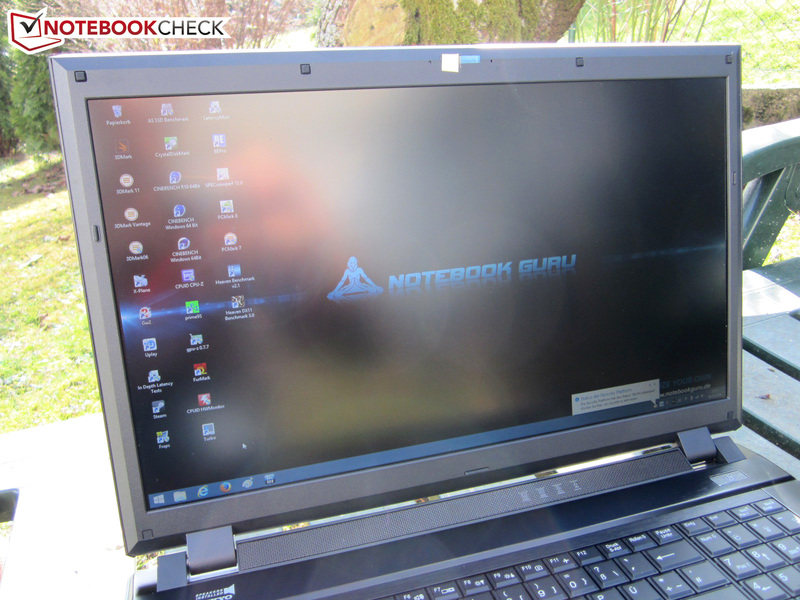 Our review sample was powered by the Core i7-4700MQ, which is already very speedy. We go on with the working memory. 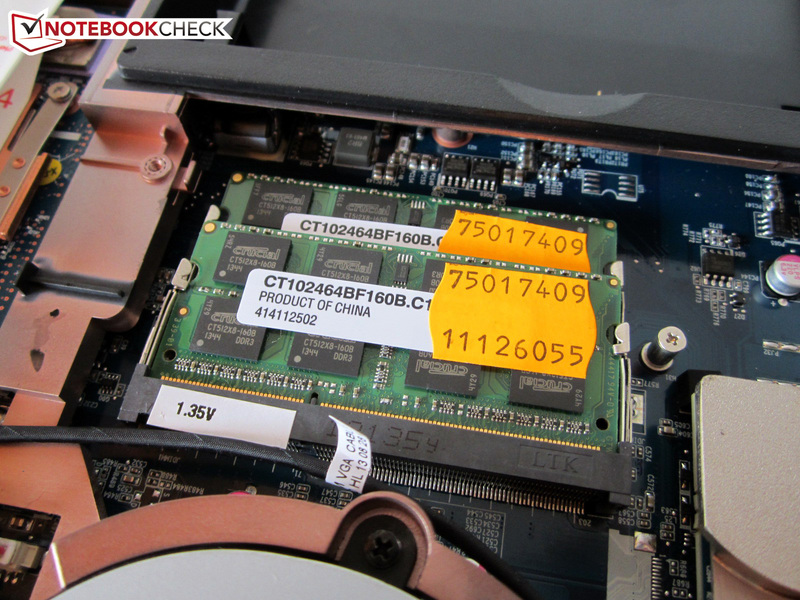 The installed 4 GB DDR3 RAM is the default configuration and can be upgraded to a maximum of 32 GB (four banks). 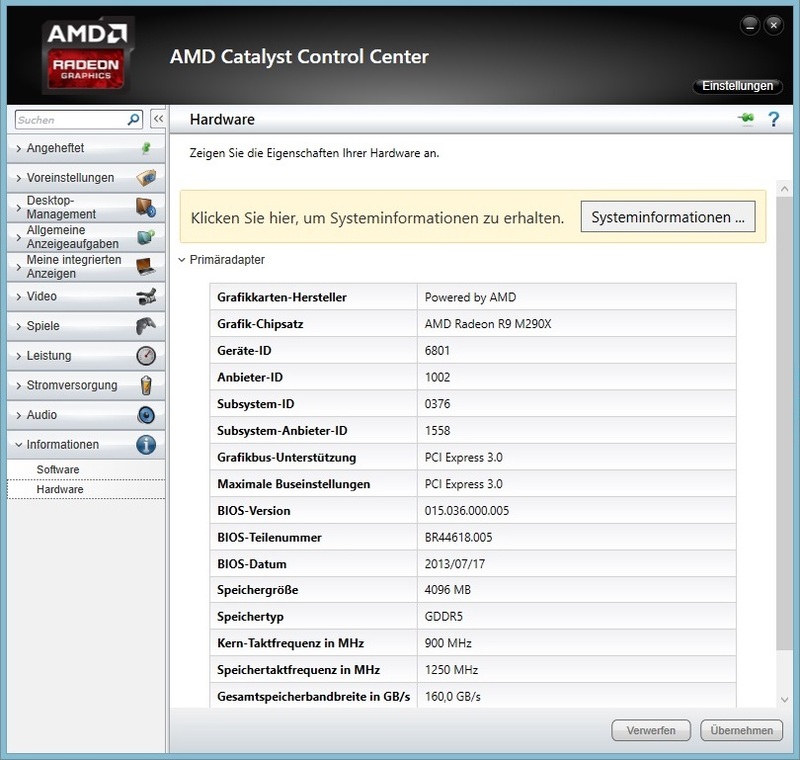 The customer can also choose the graphics expansion. The DirectX 11 GPUs can be ordered in a double-pack should a single GeForce GTX 780M or Radeon R9 M290X be too slow. A SLI array of two GTX 765M cards is also possible. Fans of the third dimension are satisfied with the optional 120 Hz screen that is offered for a surcharge. The 17.3-inch screen generally has a resolution of 1920x1080 pixels. This is complemented by - wonders never cease - two mSATA slots and two 2.5-inch slots. The latter can be furnished with HDDS, SSDs or hybrid models. 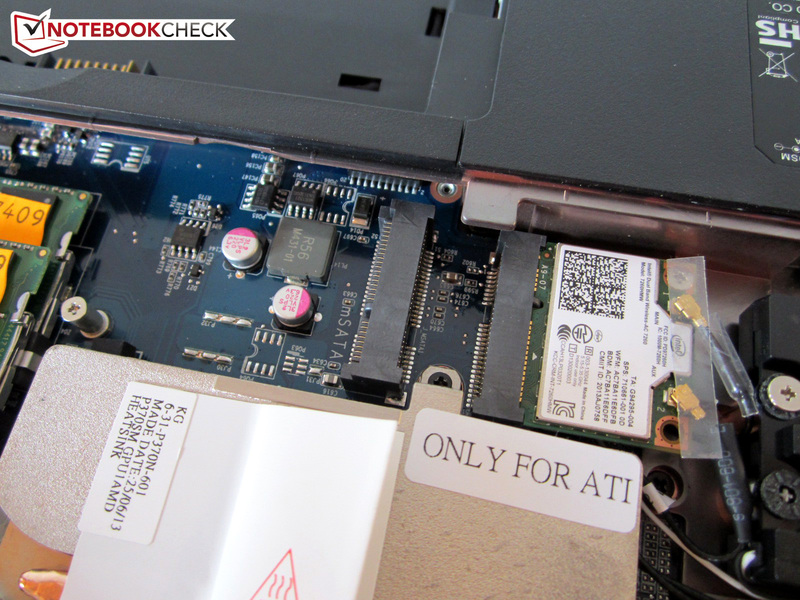 Various Wi-Fi adapters, optical drives, and operating systems round off the configuration. It is even possible to adapt the keyboard when desired. The Guru Earth V's price starts at 1249 Euros (~$1717). The version we are testing (see spec sheet on the right) would roughly cost 2360 Euros (~$3244) in the online shop. 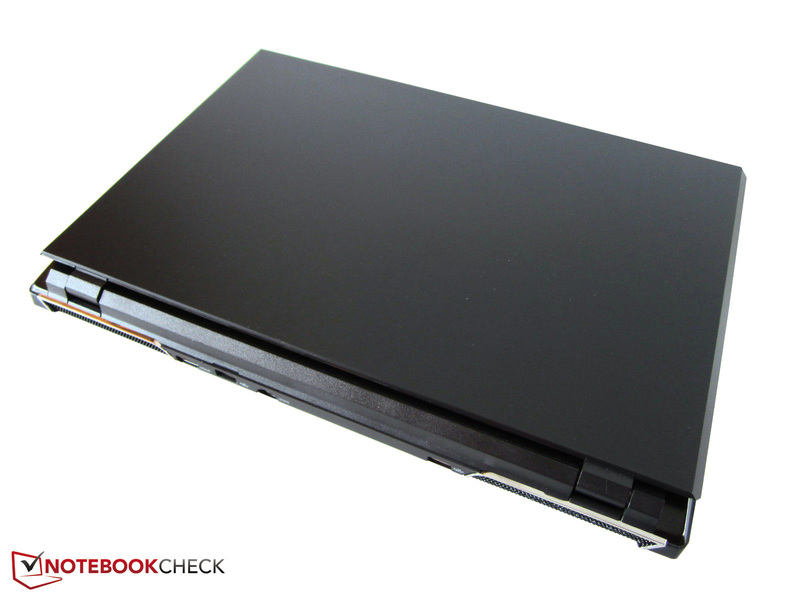 Since the P370SM barebones had to prove its capabilities several times before, as mentioned, we will not go in-depth about the casing, connectivity or input devices. In case more information is wanted about the omitted parts, this review will supply all the necessary data. 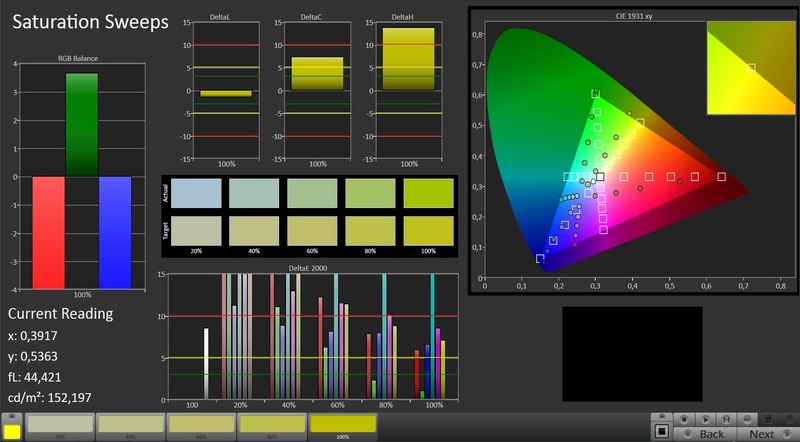 The "standard" Full HD screen that does not feature 3D proves to be an old acquaintance. 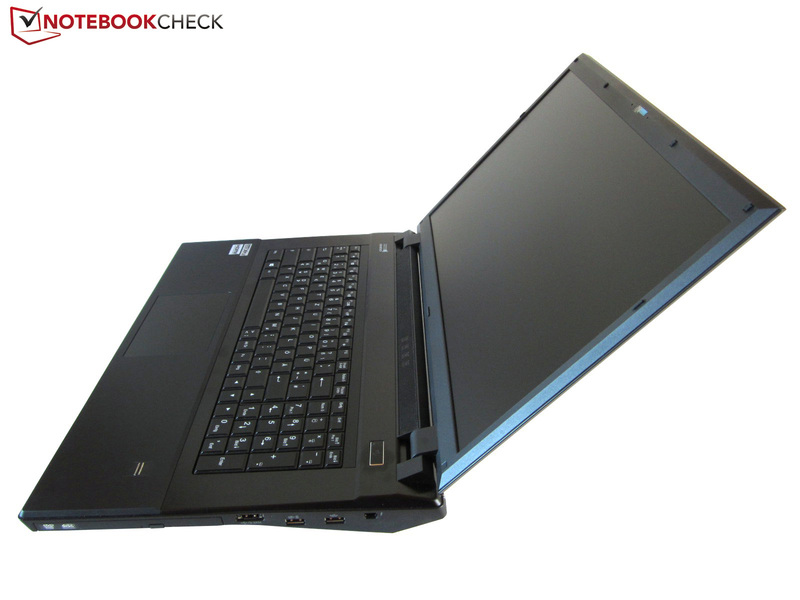 Like in numerous 17-inch gaming machines, the Chi Mei N173HGE-L11 works in the Guru Earth V. It is famous for both its good brightness and high contrast. That is no different in this case. An average brightness of approximately 300 cd/m² and a contrast of 800:1 do not give reason for complaint. Although the black level of around 0.4 cd/m² is not completely convincing, the reproduction of dark game and movie scenes will satisfy most buyers. 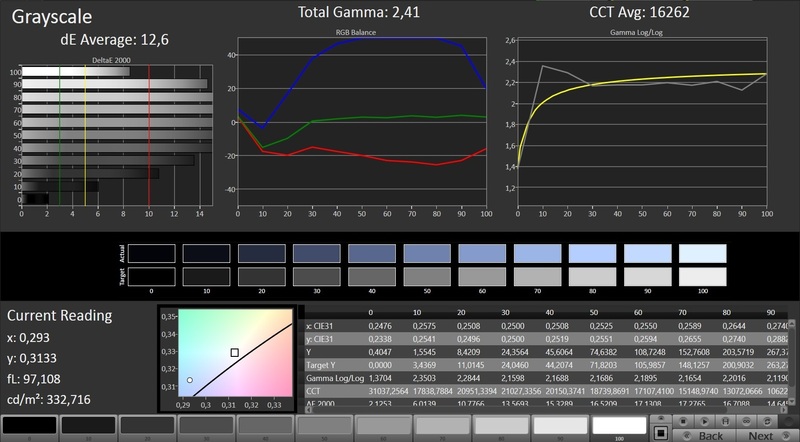 However, professional users should avoid the Chi Mei N173HGE because it has extreme deficits in color accuracy. As our CalMAN screenshots show, the image clearly shifts into blue. 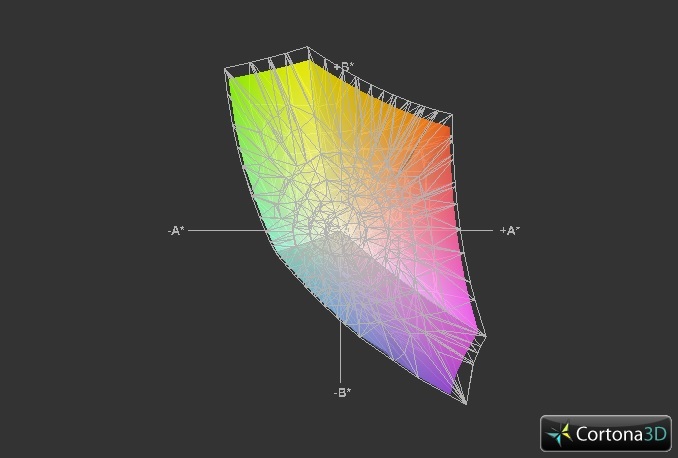 The grayscale and gamma also deviate significantly from the ideal. Nevertheless, gamers can ignore these shortcomings; the content looks rich and saturated despite the matte finish. 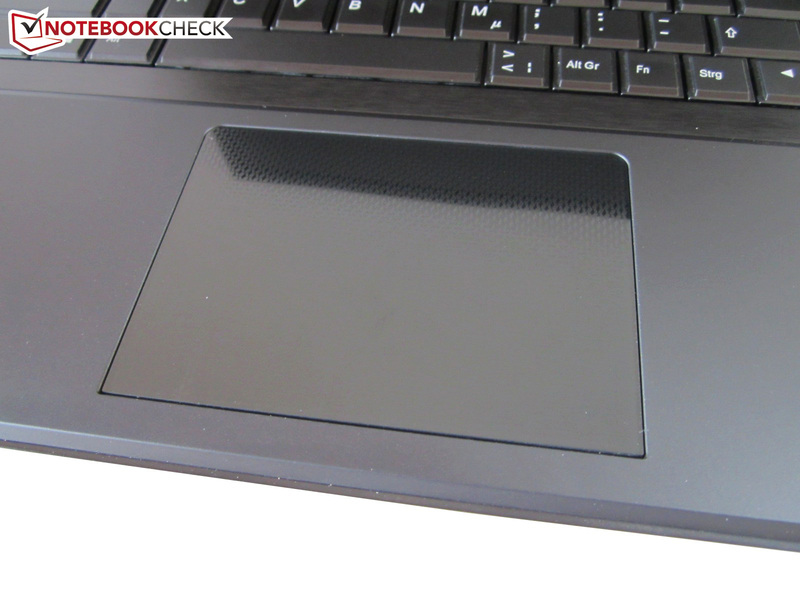 A major advantage of the matte surface is its low reflection level compared with a glossy screen. The Guru Earth V can be used outdoors as long as it is not exposed to direct sunlight or placed across from a brightly lit wall. The viewing angles are also feasible, although the monitor should not be tilted too far back or front due to the TN technology. The swift Core i7-4700MQ is a 2.4 - 3.4 GHz quad-core processor that is built in the 22 nm process like its Haswell relatives. Owing to the Hyperthreading technology, the Intel CPUs can process four (dual-core) or eight (quad-core) threads simultaneously. 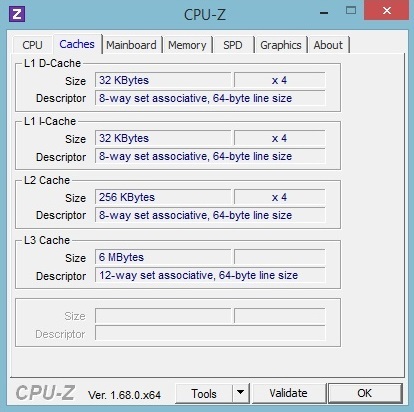 Although the 6 MB L3 cache of the i7-4700MQ cannot compete with the more expensive high-end 4900MQ and 4930MX models (both 8 MB), the performance will easily be enough for most applications. Readers who ask why the 200 MHz weaker Core i7-4702MQ costs over 30 Euros (~$41) more: The i7-4702MQ is one of the few quad-cores that are specified with 37 rather than 47 or 57 Watts. Since the P370M barebones sports a voluminous cooling system with three fans, the corresponding model only makes sense to an extent. 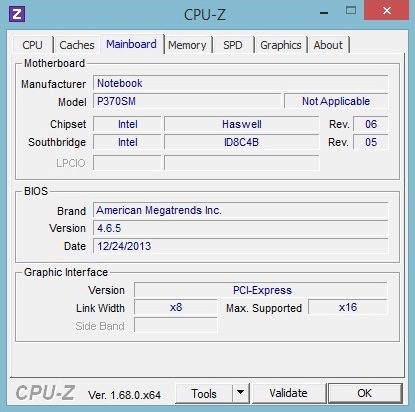 The HD Graphics 4600 chip integrated into the Haswell CPUs remains inactive due to the dual-GPU option. 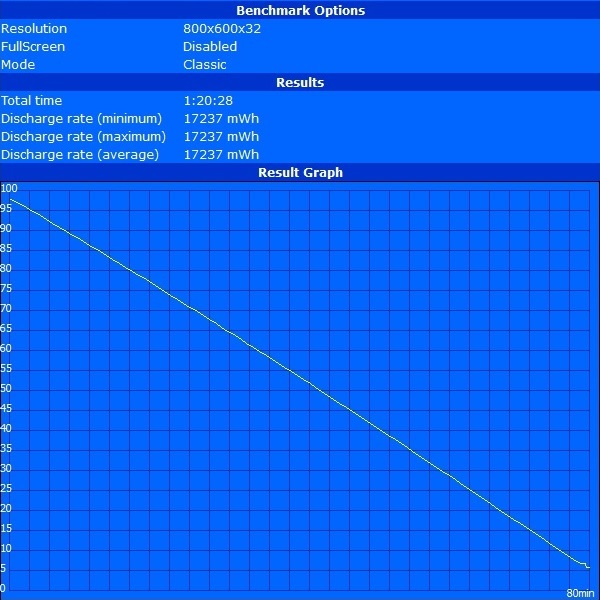 Optimus or Enduro, that normally ensure longer battery runtimes, are not available in the Guru Earth V.
The Core i7-4700MQ's behavior did not show irregularities in the test. 3.2 - 3.4 GHz in single-core applications and 3.2 GHz in multi-core benchmarks are positioned at the limit that the manufacturer specifies. The Turbo Boost mode is active even during full load: It was still 2.7 GHz after an hour of stress testing via FurMark and Prime95 tools. We never observed throttling. The CPU benchmark results all fulfilled the expectations. 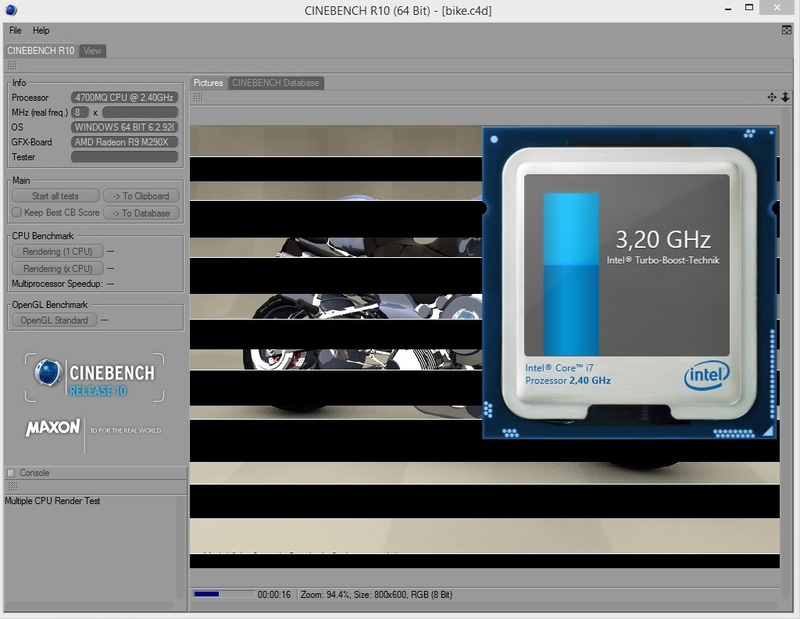 131 points in Cinebench R15 single-core test are typical for a Core i7-4700MQ, and could also be from Medion's Erazer X7825 (135 points) or Lenovo's IdeaPad Y510p (128 points). It looks just the same in the multi-core test. With 638 points, the Guru Earth V places itself exactly between the 17-inch Schenker XMG C703 (643 points) and Aorus X7 (633 points) gaming laptops, which are powered by a Core i7-4700HQ (also 2.4 - 3.4 GHz). 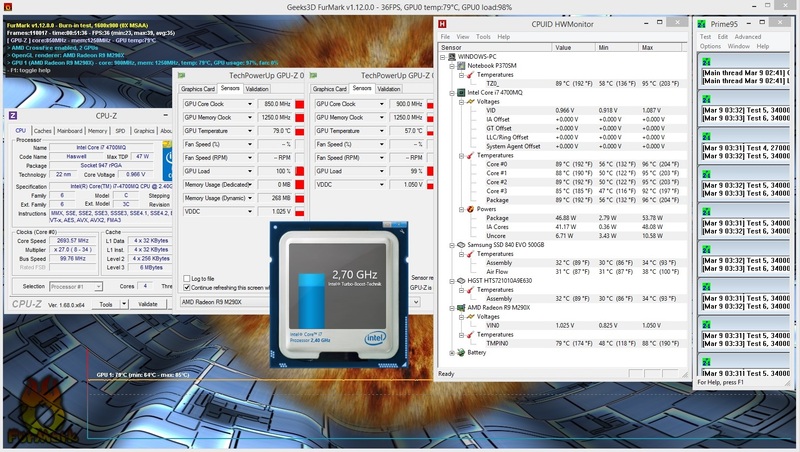 The 37-Watt Core i7-4702MQ model cannot exceed 600 points here. The same applies to the entire dual-core range. 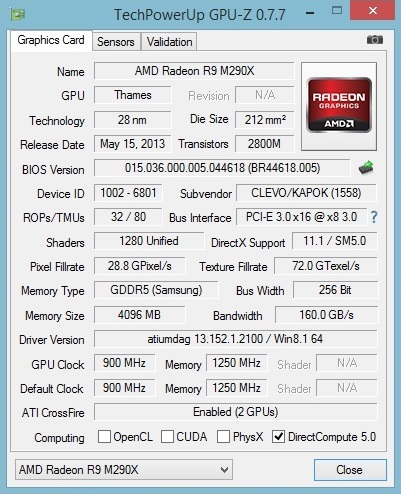 AMD's Radeon R9 M290X is not a completely new graphics card, as its name implies, but only a renamed Radeon HD 8970M. The majority of specifications remain unmodified. Be it the 1280 Shader units, the 2800 million transistors or the large 4096 MB GDDR5 video memory (256-bit interface). 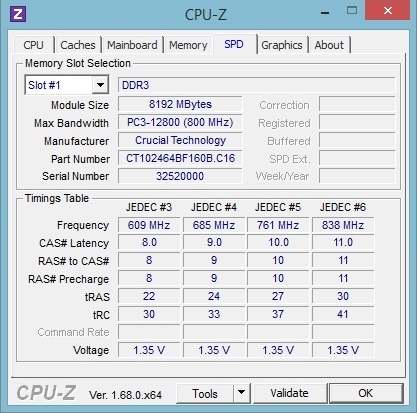 While AMD runs the core with 850 - 900 MHz, the VRAM clocks with 1250 MHz. Its manufacturing process is again 28 nm, and the architecture is still named GCN. 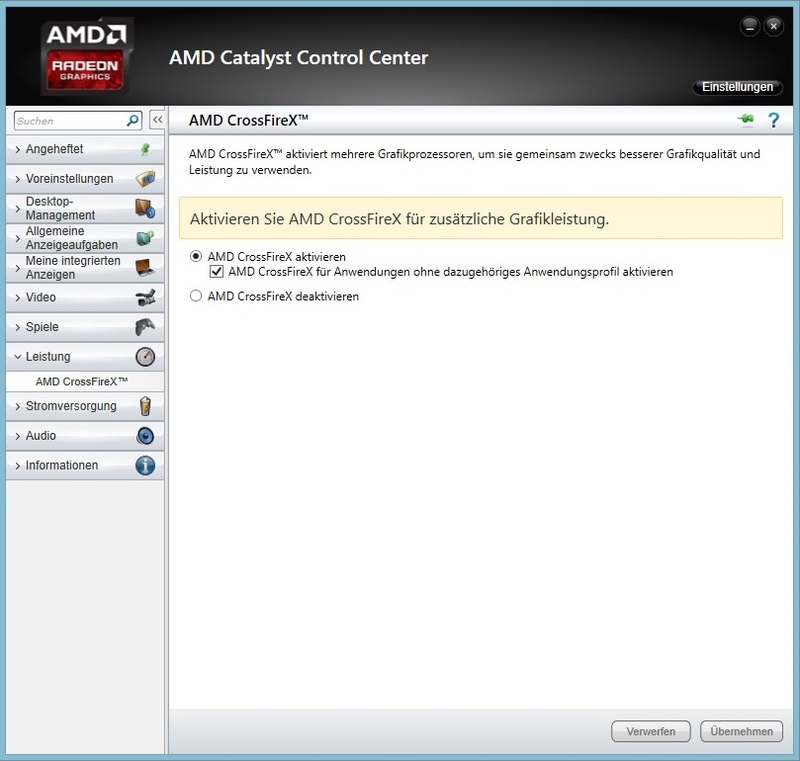 Naturally, the crossfire version is made up of two graphics cards of the same model. We will now examine whether and to what extent the R9 M290X CF can compete with single high-end chips and contenders from Nvidia. 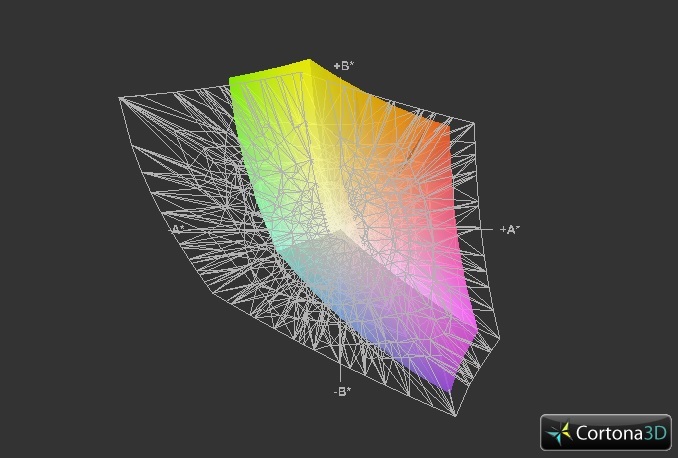 Popular 3D applications that feature a Crossfire profile clearly benefit from a second GPU. An example would be 3DMark 13's Fire Strike test that gets along with AMD particularly well. Owing to a GPU score of 10,551 points, the R9 M290X CF not only places itself above the GTX 765M SLI (7991 points @ Aorus X7), but also 5% in front of the GTX 780M SLI (10,091 points @ Alienware 18). 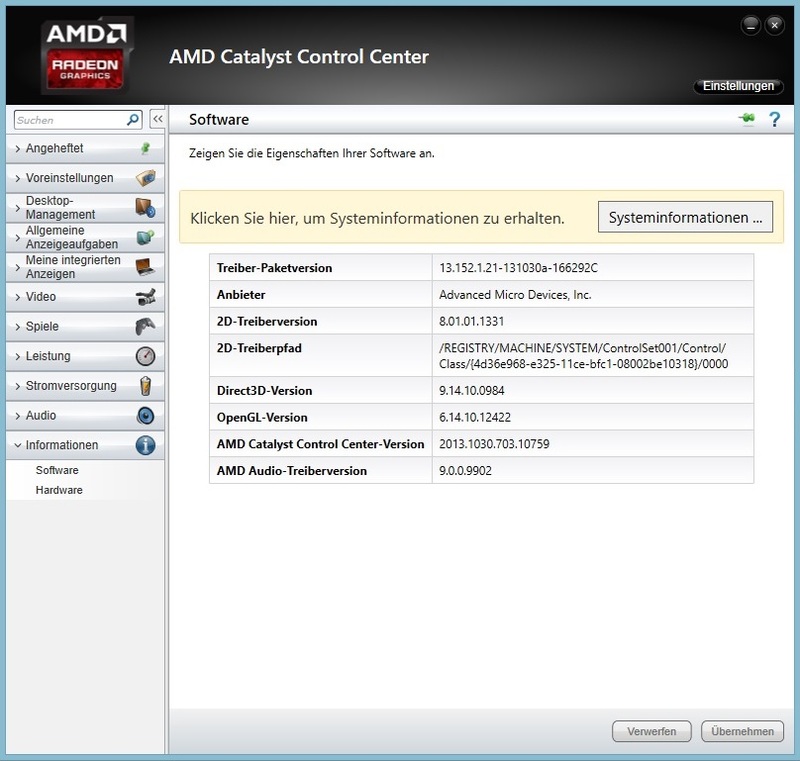 A Radeon HD 8970 that operates without Crossfire lags behind by about 50% (5110 points @ One K73-3N). The ranking goes in favor of Nvidia in the Unigine Heaven 3.0 benchmark (1920x1080, high, default tessellation). With 122.1 to 133.0 fps, the R9 M290X CF is not really a threat for the GTX 780M SLI. A single HD 8970M achieves just over 60 fps; the GTX 765M SLI has to be satisfied with approximately 70 fps. Our test file was stored on a big 500 GB SSD. Despite its reasonable price, the Samsung 840 EVO belongs to the swiftest solid-state drives on the market. 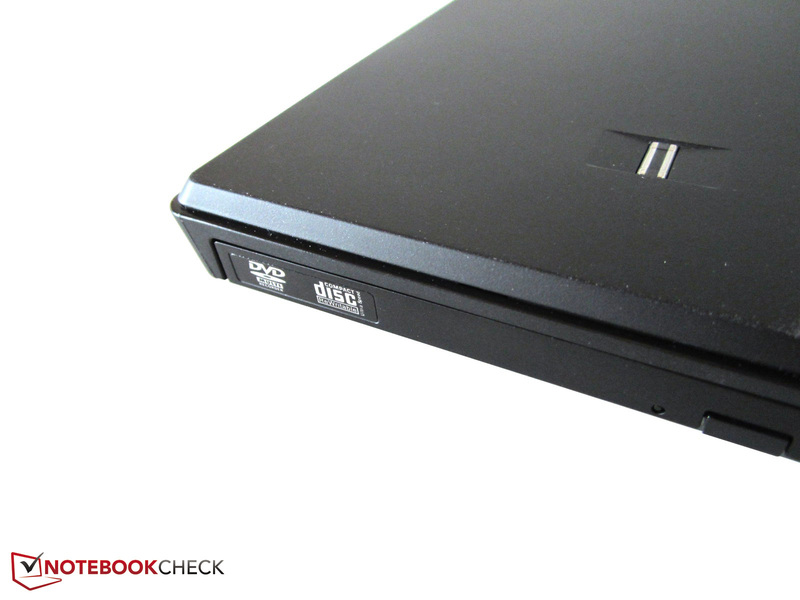 With a sequential write speed of 490 MB/s, the 2.5-inch drive surpasses the standard 840 by about 50% (331 MB/s @ One K56-3N2). The EVO also usually wins in compact files. The non-EVO is approximately 10% inferior when all rates are added up and the total score is compared. 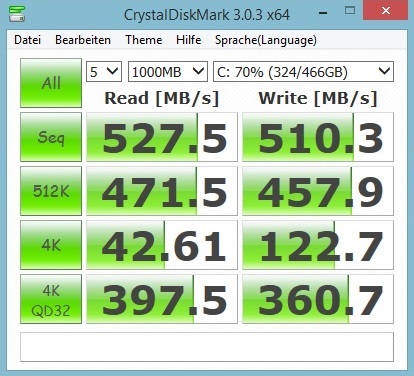 The access time of both SSDs is good (~0.03 ms @ write). However, a second storage device also finds room in the hard drive cage. We would recommend the HGST Travelstar 7K100 with 7200 rpm if an HDD is being considered that does not add more than 100 Euros (~$137) to the price. The terabyte model surpasses almost all contenders. Sequential read and write rates of over 130 MB/s strongly remind us of the XMG P304 that featured the same hard drive in the test. 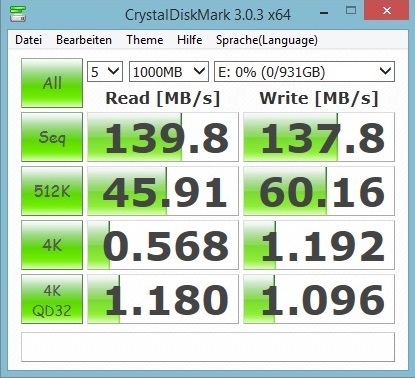 Smaller and/or slower 5400 rpm HDDs often have problems exceeding 100 MB. 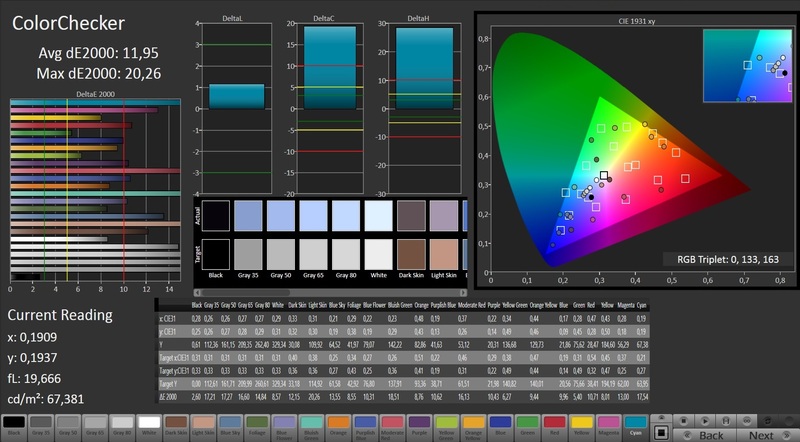 Unsurprisingly, the Guru Earth V also convinces in system performance. Although it is not enough for an absolute top score in PCMark 7, 5207 points are definitely impressive. 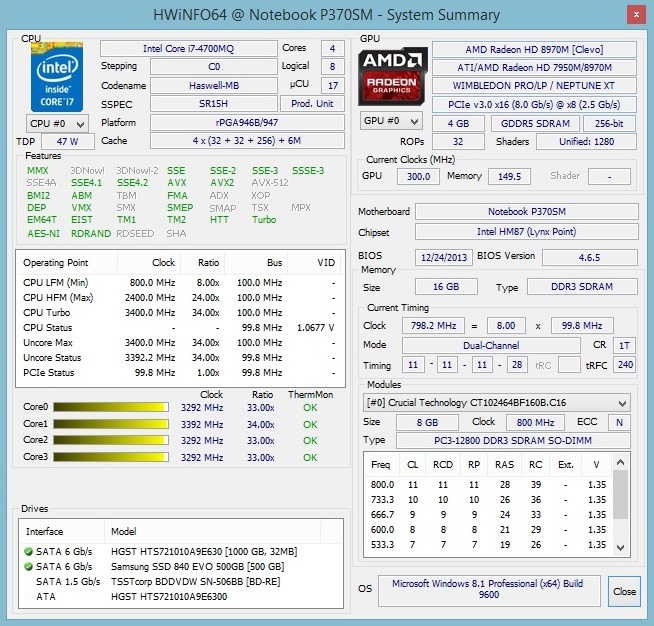 MSI's GE40-i760M2811 (Core i7-4702MQ, GeForce GTX 760M, 128 GB mSATA SSD) reaped in a very similar score late 2013. 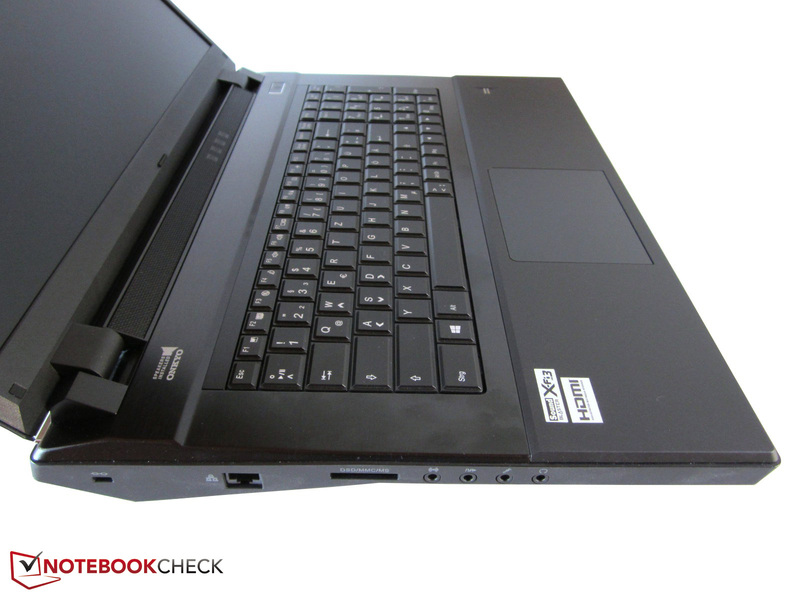 The identically built One K73-3S, with a Core i7-4800MQ, Radeon HD 8970M CF, and a 500 GB SSD only achieved a marginally higher 5412 points. The Radeon R9 M290X CF is powerful enough to render most games smoothly in 1920x1080 pixels, maximum graphic settings, and multiple anti-aliasing on the screen. The Crossfire array only has a hard time with extremely demanding or poorly optimized games like X-Plane 10. It is however too bad that not as many games support dual-GPU support as Nvidia does. While the Aorus X7 usually delivers twice the performance (GTX 765M SLI vs. GTX 765M), the Crossfire in the Guru Earth V only achieved a noticeable performance plus in 2/3 of the cases. A few games (e.g. 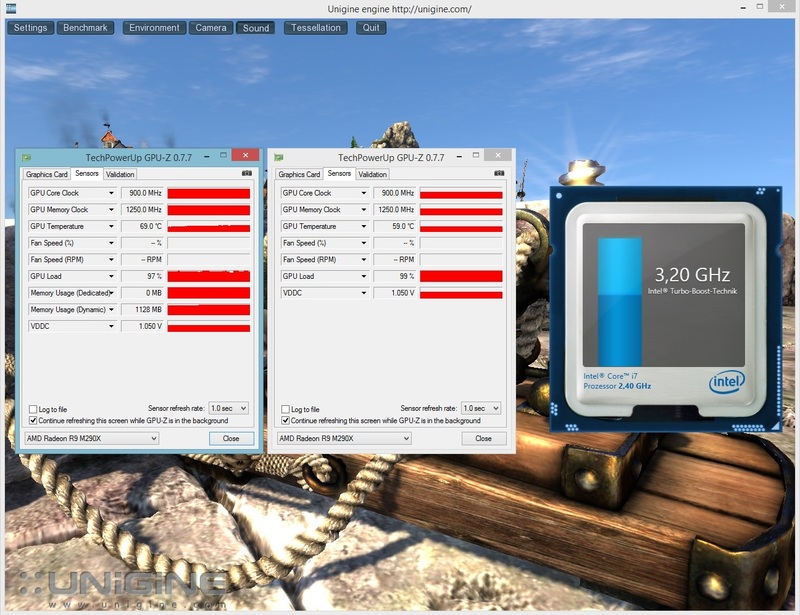 Guild Wars 2) even ran slower than on a single GPU. Massive image errors (e.g. black lines) often occur when starting a game or other 3D applications. This particularly affects intro videos. Call of Duty: Ghosts did not run well at all on the R9 M290X CF. 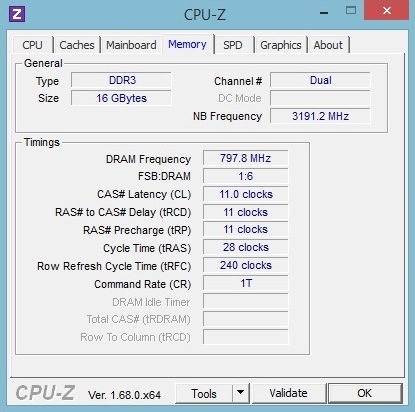 A single HD 8970M calculates much faster in some cases. When using 1920x1080 pixels, the image in Guild Wars 2 permanently scrolled from top to bottom. We also experienced unfounded performance decreases. Generally, the frame rate seems to have a higher fluctuation rate than by Nvidia. Micro-stuttering is also more intense/frequent subjectively, whereby the R9 M290X CF does not often reach critical fps regions. The words in Thief were not displayed correctly (omitted letters, etc.). The benchmark delivered the "right" result only in the second run. Users who do not want to take unnecessary risks, and do not want to update the driver repeatedly will be happier with a "conventional" laptop with a single GPU. Crossfire and SLI machines are only interesting for a small consumer group. A short note about the ranking: While the HD 8970M CF achieves the same performance overall (One K73-3S), the GTX 780M SLI is 10% faster (Alienware 18). In view of the extra charge of 500 Euros (~$687), Nvidia's advantage is rather slight. Noise-sensitive users will not be satisfied with the Guru Earth V. The barebones manufacturer Clevo has not made any major modifications in fan management since our last test. The 4-kilogram (~8.8 pounds) machine is already clearly audible in idle mode. A reading of 39 dB(A) at a distance of 15 cm (~6 inches) would usually come from other notebooks only when under load. We perceived the short speed increases (~44 dB(A)) as particularly distracting, but many Clevo barebones struggle with this issue. The noise level increased to approximately 47 dB(A) in gaming use, which is also very high. 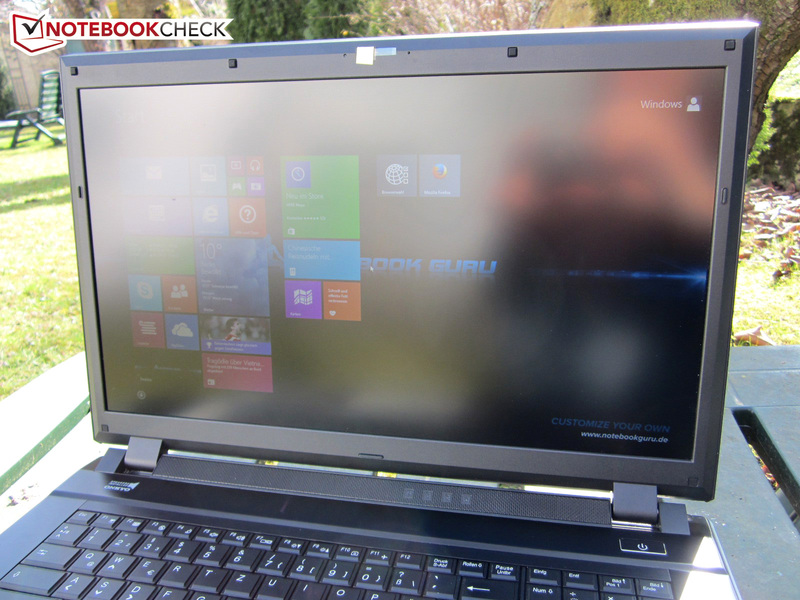 We could extract a maximum of 53 dB(A) from the laptop. With the exception of the full load test, the competing Alienware 18 was always quieter (30-34 dB(A) @ idle; 40 dB(A) @ 3DMark 06). 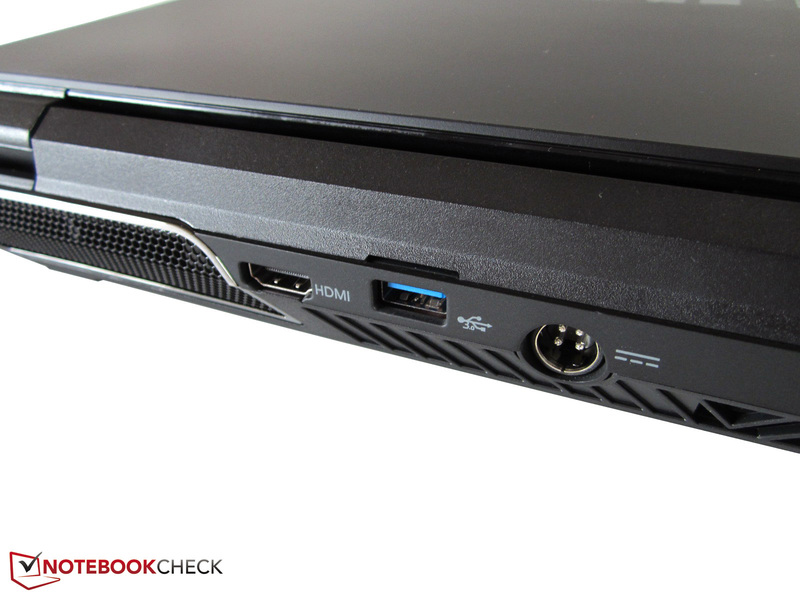 The P370SM would certainly still allow a lower noise level when looking at the hardware temperatures. As to the temperatures: The casing's surfaces remained amazingly cool during basic tasks like MS Office, Internet or videos. Around 28 °C (82.4 °F) in idle mode and an average of 32 °C (89.6 °F) during extreme load are not uncomfortable even over a long period. The Guru Earth V only reached a maximum of 35 °C (95 °F) (upper side) and 39 °C (102.2 °F) (underside) even in the fan's area, which traditionally heats up in particular. 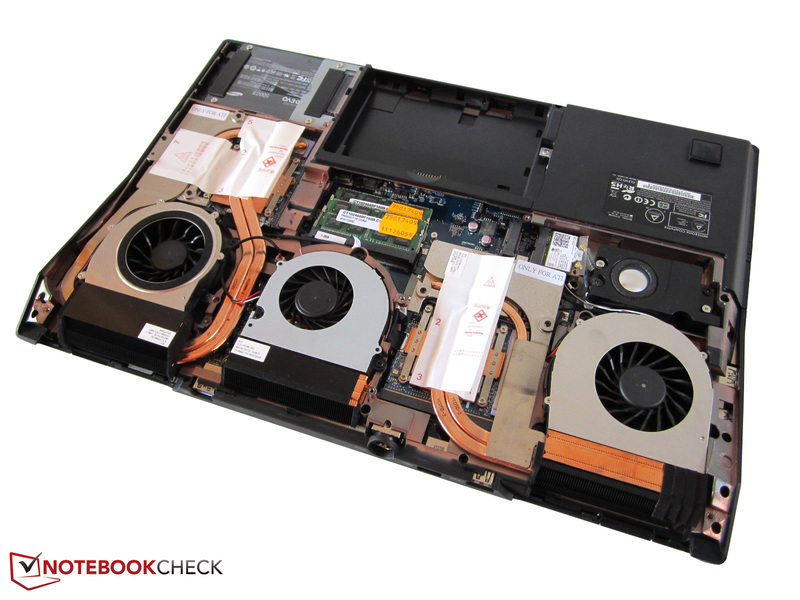 Most gaming laptop settle at much higher temperatures, and over 50 °C (122 °F) in the stress test is often nothing unusual (e.g. Toshiba Qosmio X70). The Guru Earth V does not fare quite as well with the hardware. As known from Intel's Haswell generation, the processor climbs up to extreme temperature regions. 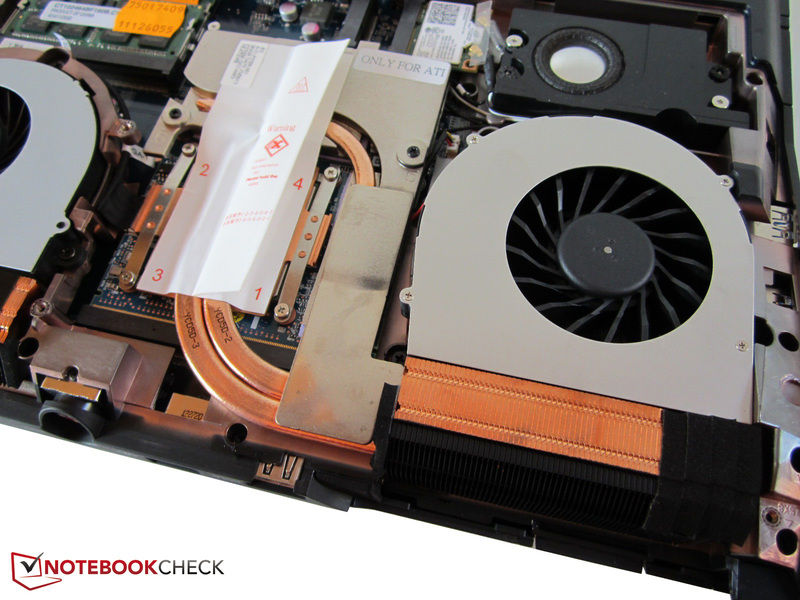 The fans turn up to full speed as soon as the Core i7-4700MQ comes near the 100 °C (212 °F) area. 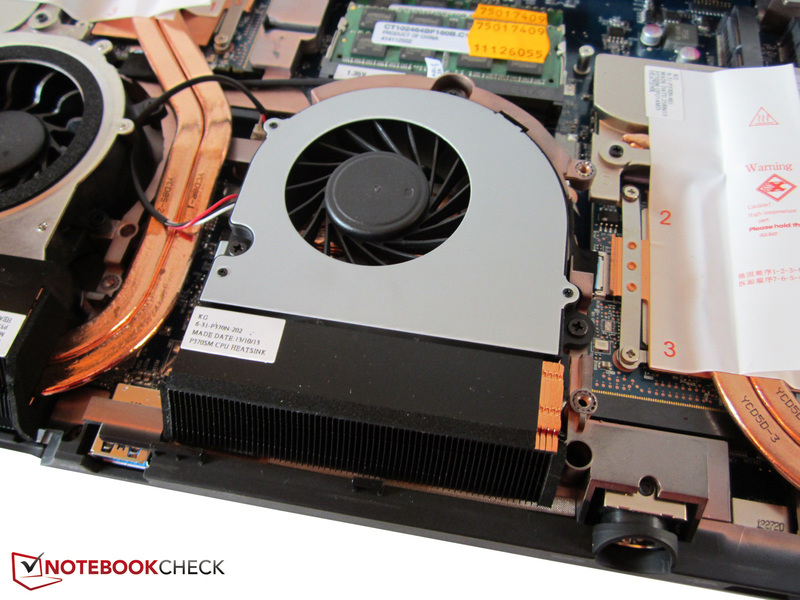 One of the two Radeon chips also got very hot with up to 88 °C (190.4 °F). We ascertained an average temperature of 89 °C (192.2 °F) (CPU), 79 °C (174.2 °F) (GPU1), and 57 °C (134.6 °F) (GPU2) at the end of the stress test. However, the situation never was really critical. (+) The maximum temperature on the upper side is 35 °C / 95 F, compared to the average of 39.3 °C / 103 F, ranging from 21.6 to 68.8 °C for the class Gaming. (-) The average temperature of the palmrest area of similar devices was 28.7 °C / 83.7 F (-2.6 °C / -4.6 F). 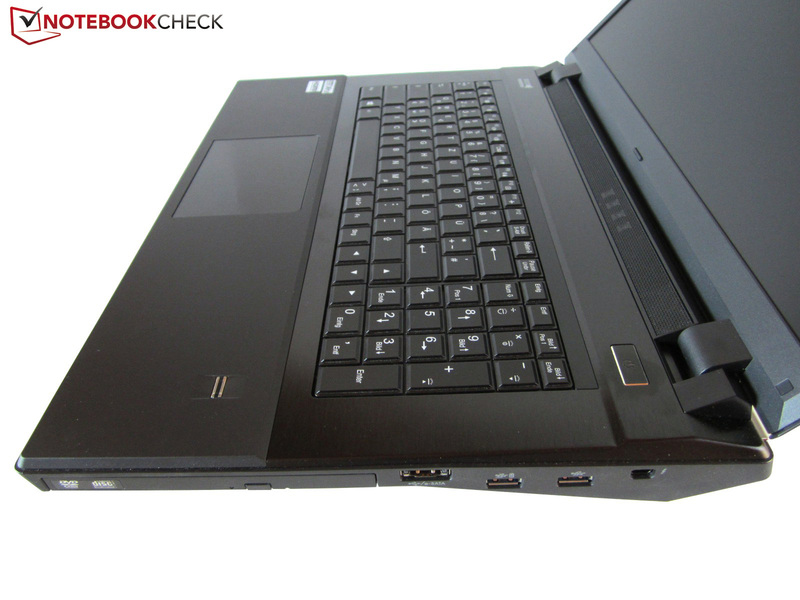 Information about the speakers can be found in the review of the Schenker XMG P723. Since the Radeon R9 M290X is nearly the same as the old HD 8970M, it is not very surprising that the power consumption is very similar. With 35 - 49 Watts, the Guru Earth V consumes virtually the same amount of power as the One K73-3S (35 - 46 Watts). 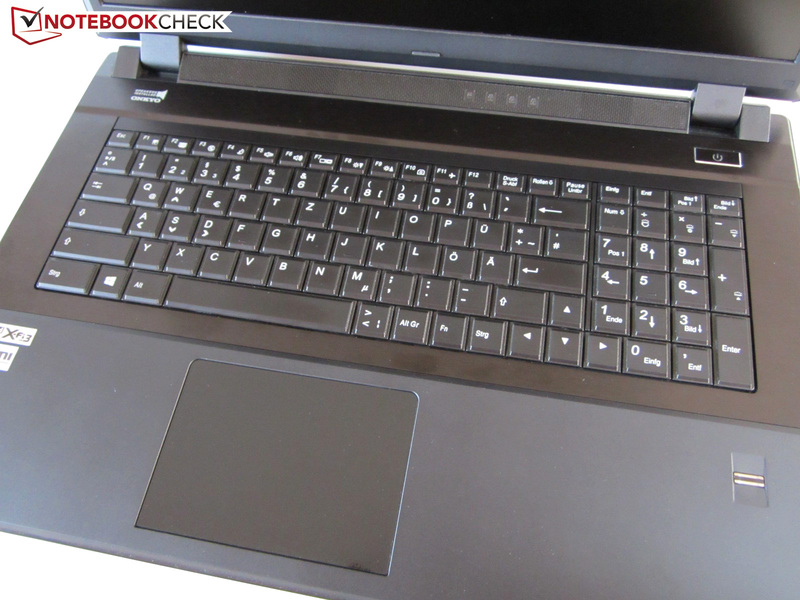 The Alienware 18 is a bit more energy-efficient despite its stronger hardware configuration (Core i7-4930MX & GeForce GTX 780M SLI), and "only" drained 29 - 49 Watts from the outlet. The three laptops do not differ much in 3DMark 06. Regardless whether it was the Guru Earth V, One K73-3S or Alienware 18, our instruments recorded an average from 155 to 159 Watts. In return, the differences in full load are gigantic. 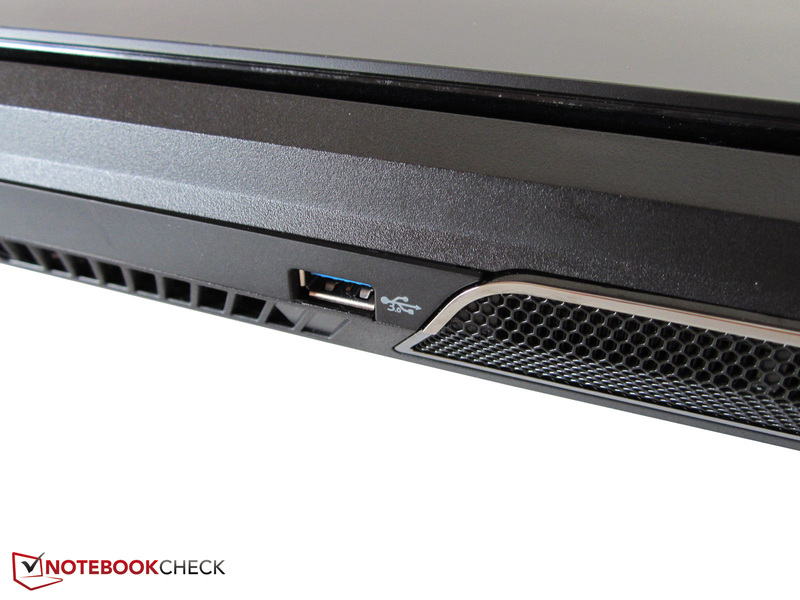 While a P370SM barebones featuring a dual-AMD configuration consumed approximately 230 Watts, the Alienware 18 with the same equipment required up to 322 Watts. 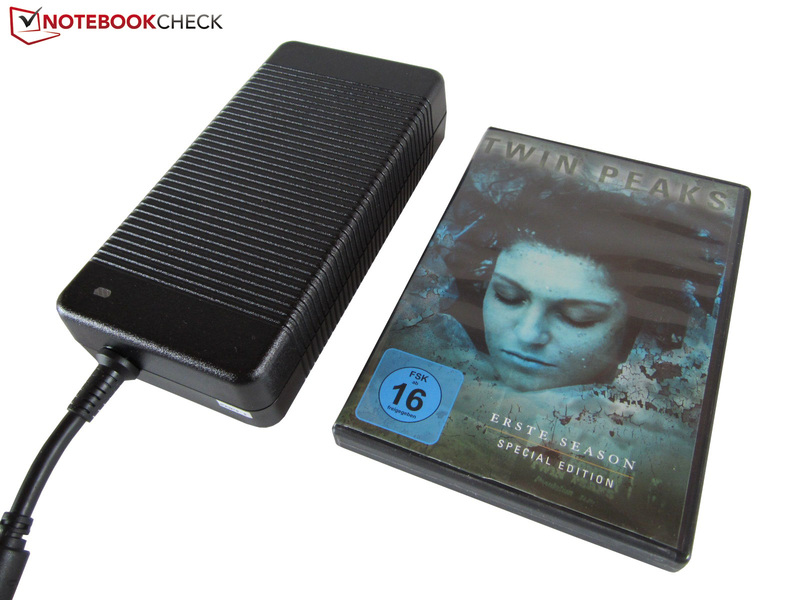 Nevertheless, Clevo includes a huge 330-Watt power supply for the laptop (198 x 97 x 44 millimeters; 7.8 x 3.8 x 1.7 inches) that weighs over 1.2 kilograms (~2.64 pounds). The user should not put very high expectations in battery runtimes. 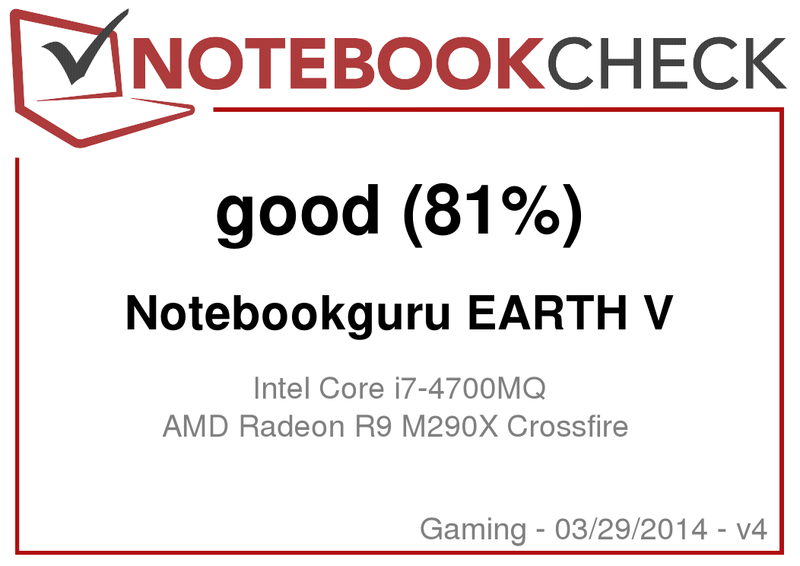 Although a powerful 8-cell model with 89 Wh supports the Guru Earth V, the laptop is drained after 1 - 2 hours using enabled Crossfire mode. Reducing the screen's brightness and turning the energy-saving options to maximum does not help much either. Although approximately 80 minutes in 3D operation are decent in the class comparison, the P370SM is not very suitable as a portable gaming platform. 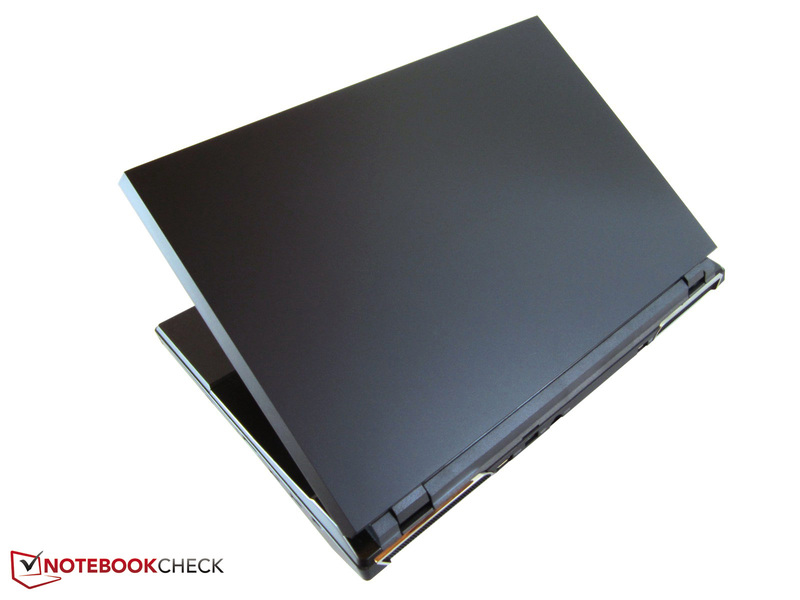 The 17-inch device has been primarily conceived for stationary use. The Guru Earth V is certainly not a device for everyone. 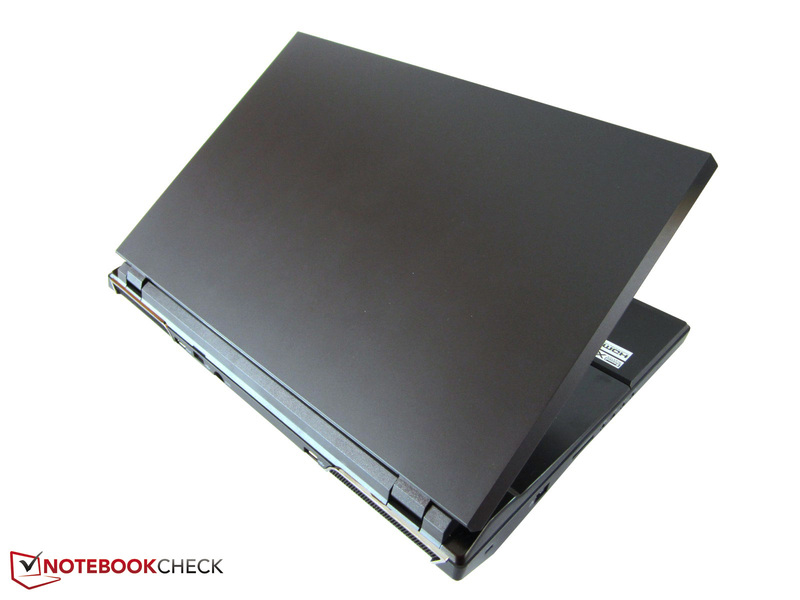 It can only be called a "laptop" to a certain extent in view of a casing weight of 4.3 kilograms (~9.5 pounds) and height of approximately five centimeters (~2 inches). Desktop replacement would be a more suitable term. The P370SM is also fairly impressive as a member of the DTR category. Of course, the high-gloss touchpad gets annoying after a few minutes (poor gliding properties, insufficient stability, unreliable inputs, etc.). Additionally, the fans gain an extreme speed in 3D operation. Otherwise, we did not find any serious drawbacks. The bulky power supply, the short battery runtimes, and the screen's disappointing color accuracy will unlikely deter most gamers. On the pro side, we primarily have the first-rate performance. The Guru Earth V outshines the entire competition owing to the optional second "graphics-whopper". 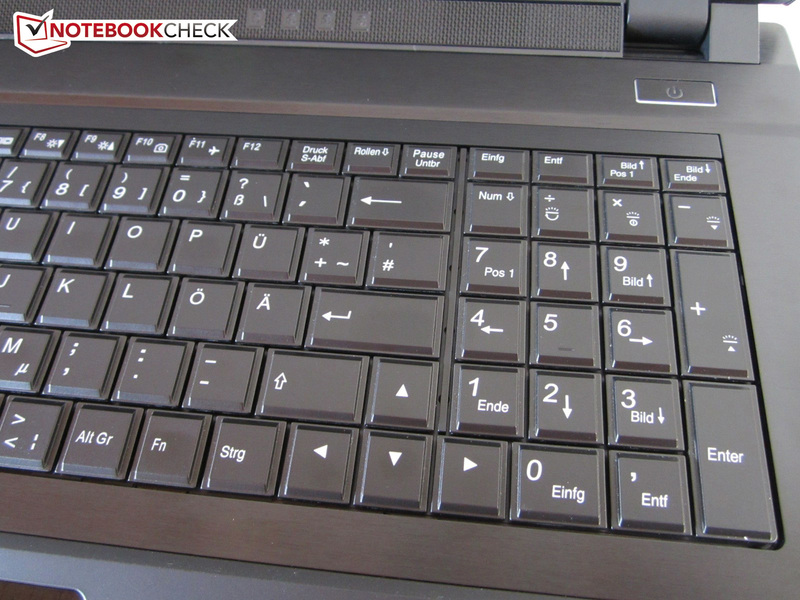 Only the 18-inch Alienware 18 or other laptops based on the P370SM or P375SM barebones are worthy rivals. The individual configuration and excellent maintenance options also add to the device's consideration. 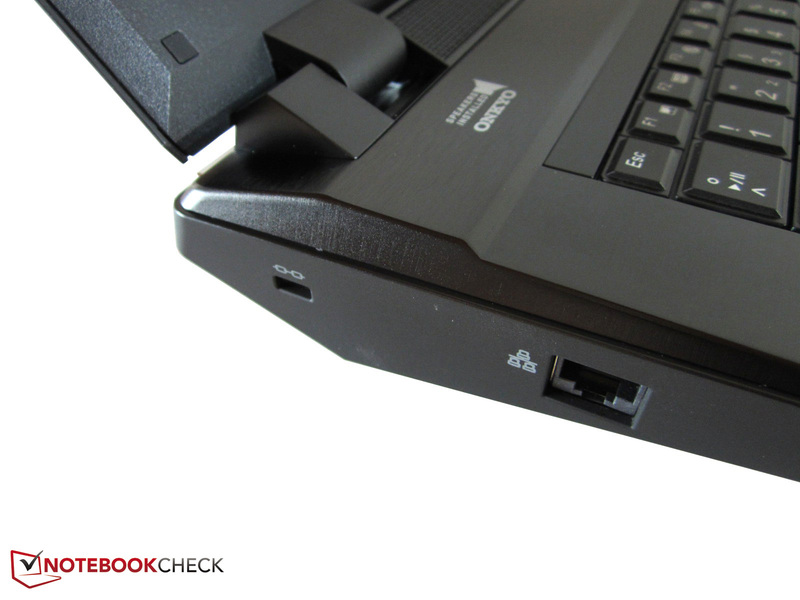 In our opinion, the casing's pleasantly cool surfaces, the stylish backlit keyboard, and the generous connectivity (Thunderbolt port!) are even more buying arguments. Those who want to replace their desktop PC without making compromises can confidently think about purchasing this device. Guru EARTH V. Review sample courtesy of Notebookguru. The rubber-coated lid attracts fingerprints. There are barely any glossy parts to be found. The warm air is discharged over the rear. 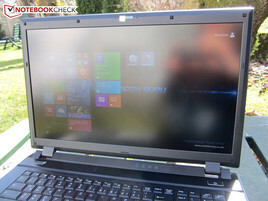 The anti-glare screen has a native resolution of 1920 x 1080 pixels. 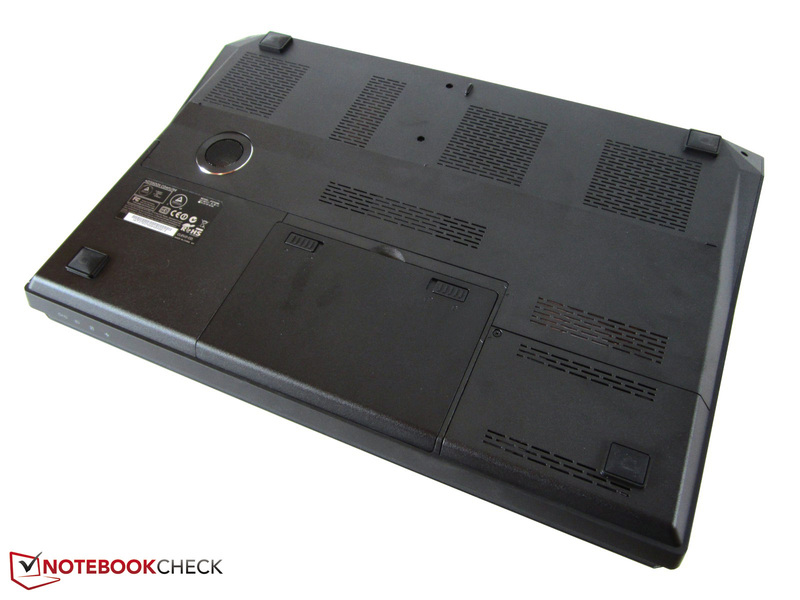 The laptop weighs over four kilograms in the worst case. 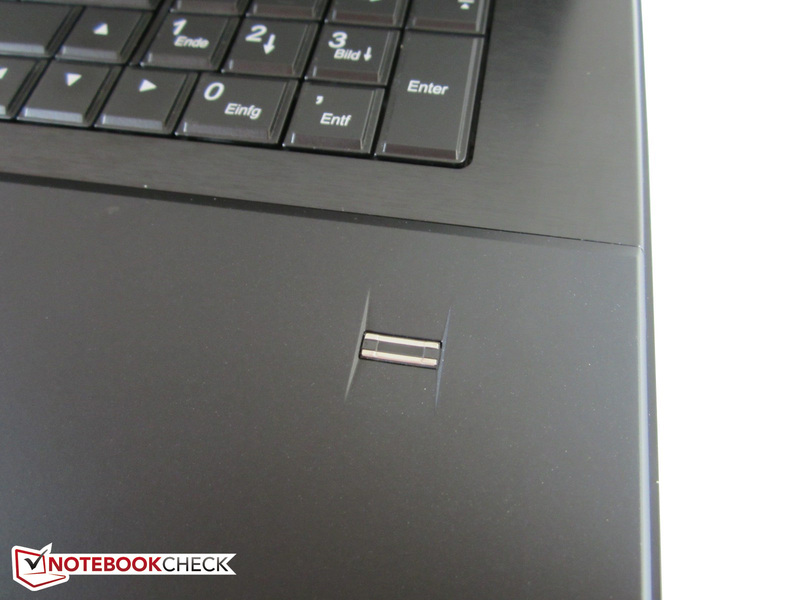 We would have appreciated a USB port on the left. Otherwise, the interface positioning is good. 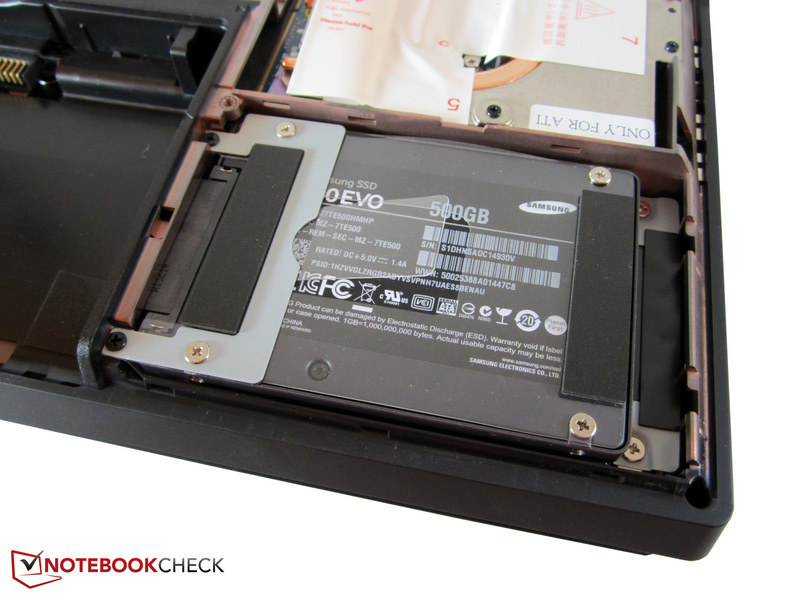 Even inexperienced users can remove the base plate. The gaming behemoth sports a total of three fans. The graphics cards and processor can be replaced. Both sides of the motherboard feature two RAM banks. The wireless module is on the mSATA slot's right. 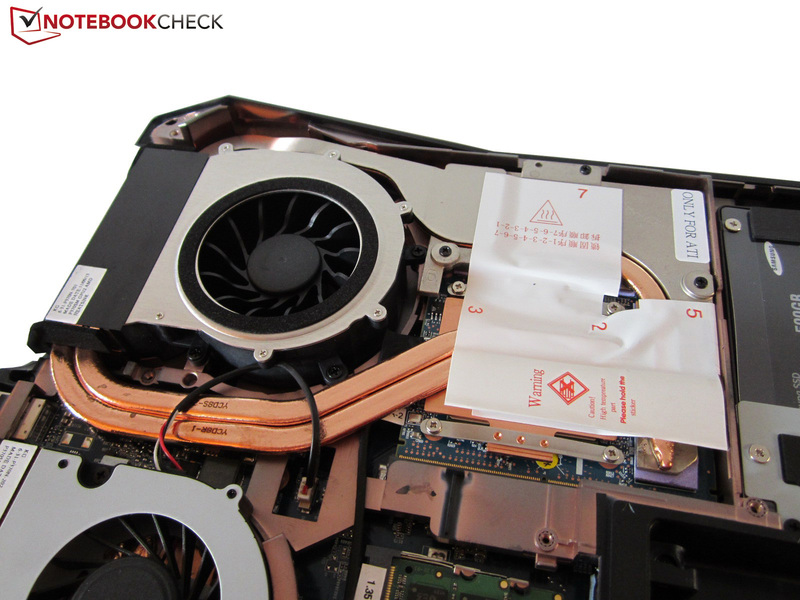 The center fan is responsible for the CPU. The buyer can choose between Nvidia and AMD. The 2.5-inch slots are stacked. 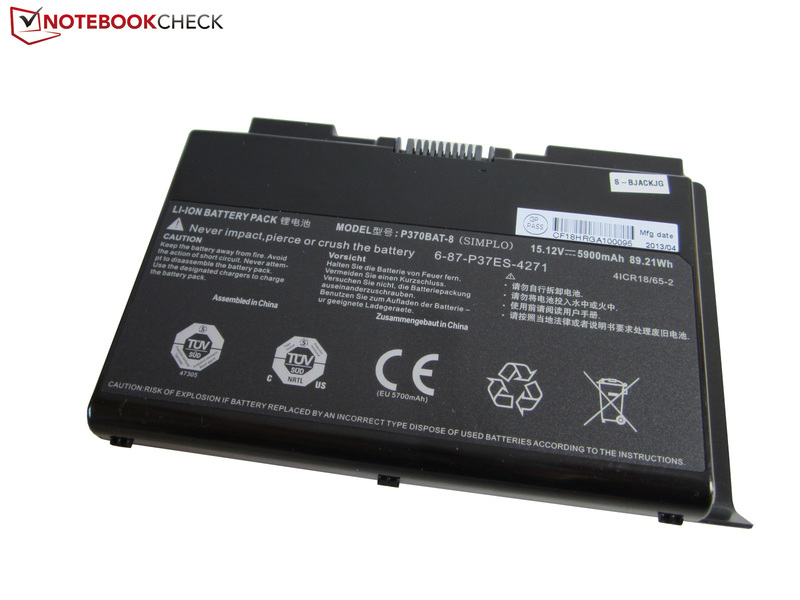 A high-capacity battery supports the laptop. The webcam has a resolution of two megapixels. 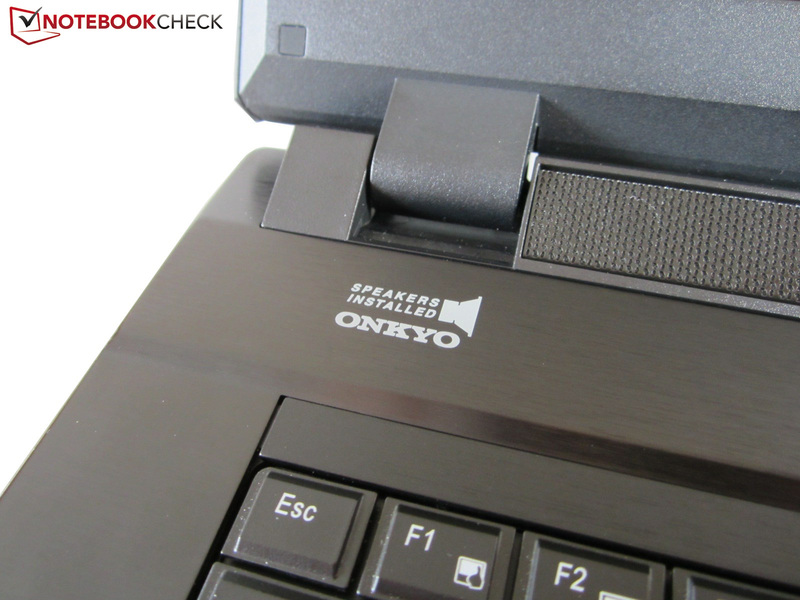 The keyboard's screws can be accessed using a thin object. 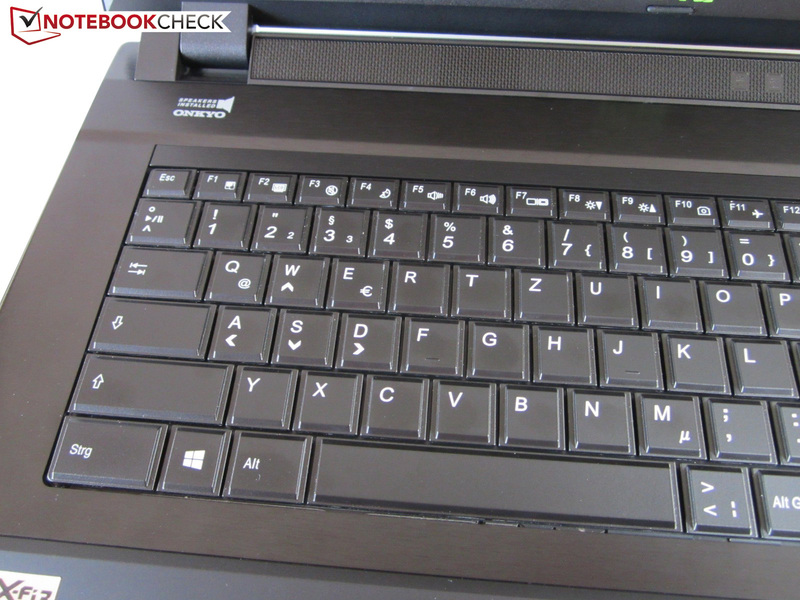 The keyboard can be illuminated in three zones. 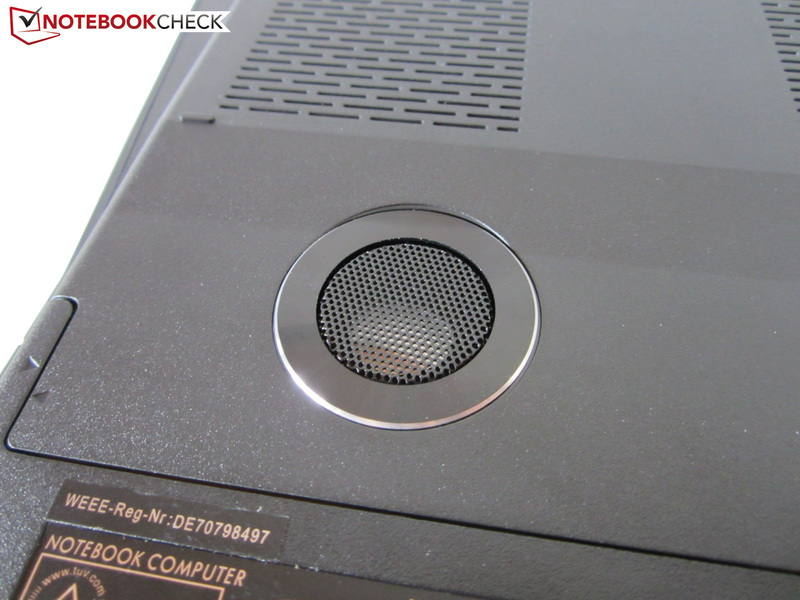 A subwoofer is on the underside. The speakers come from Onkyo. Not every contender features a fingerprint scanner. The layout is certainly a matter of taste. A single-row enter also in the German edition. The developers should rework the touchpad. 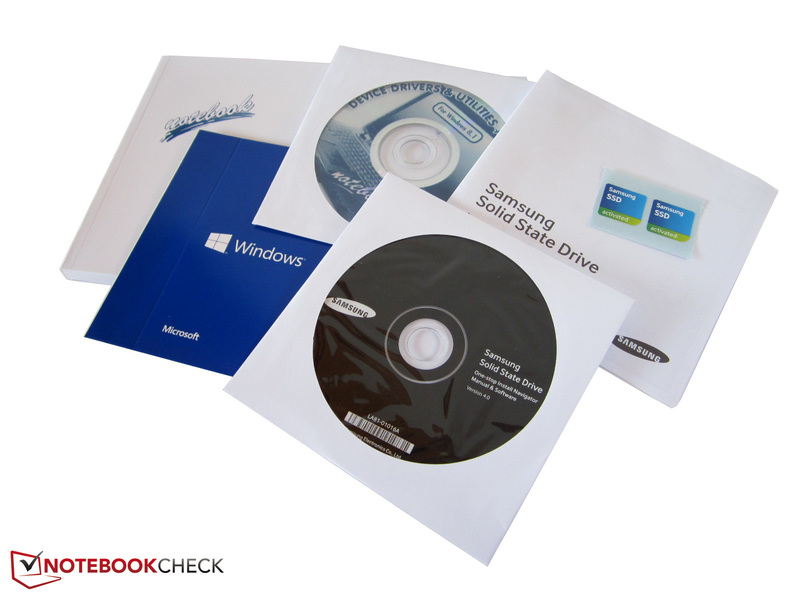 Drives with Blu-Ray support don't cost a fortune. There is even a Thunderbolt port. The HDMI port serves video output. 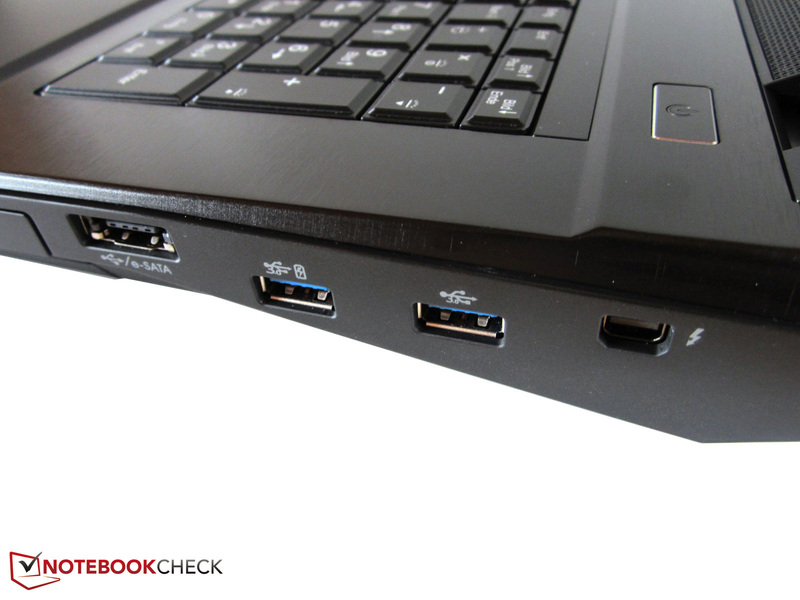 Four USB 3.0 ports are praiseworthy. 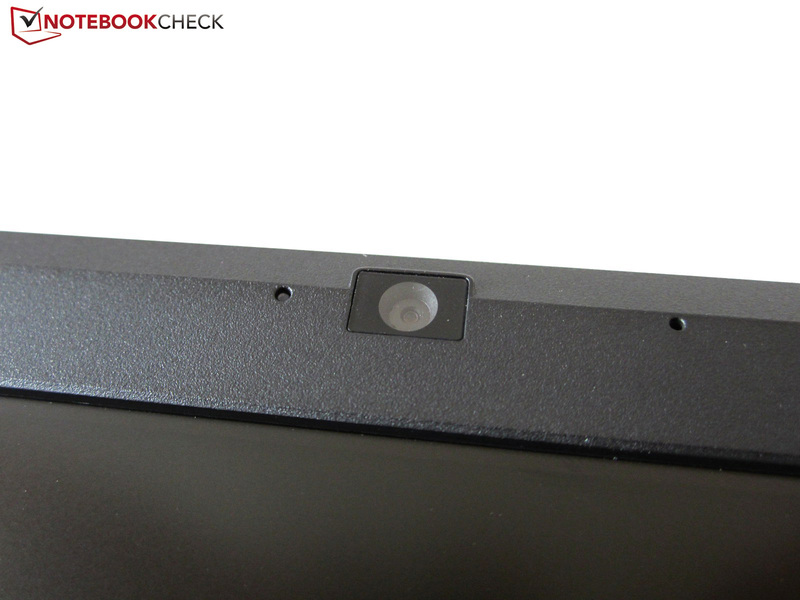 The laptop can be secured against theft via the Kensington lock. 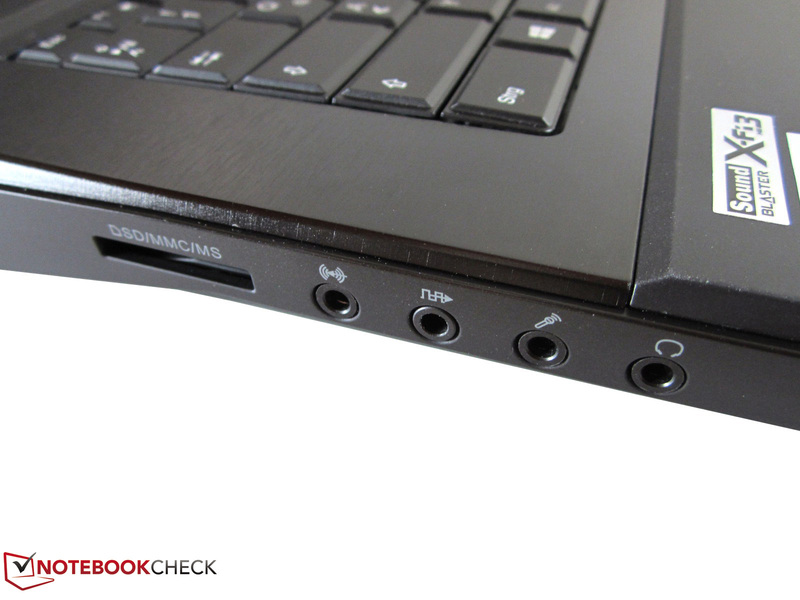 The audio jacks also support surround systems. The equipment depends on the configuration. The 330-Watt power supply is extremely bulky. 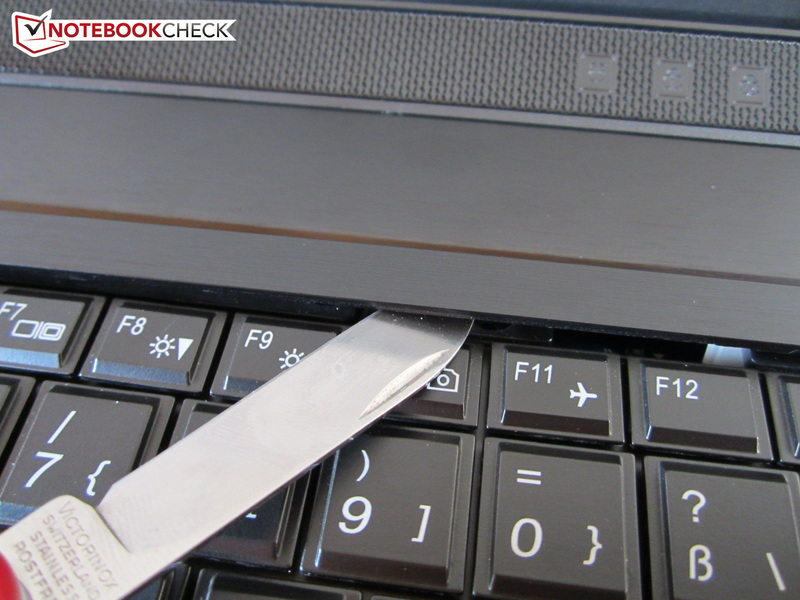 The ease of upgrading and maintaining the laptop. The fan management could use some tuning. New name, old performance: What's the point AMD? High-performance, 17-inch laptops like: Aorus X7, Asus G750JH, Alienware 17, Medion Erazer X7825, MSI GT70H, One K73-3N, Schenker XMG P703 or Toshiba Qosmio X70.